I’ve been shooting weddings for 7 years now, in that time I’ve been to over 200 weddings and met some incredible people along the way. I’m so lucky that my couples are the nicest people ever and have kindly left me some amazing feedback over the years. I often get asked where they can leave kind words after the wedding and I’ve not really had a format for that until now, just hearing that people love their photos and the fact that so many have recommended me to their friends and family is more than enough for me. So this page is going to be dedicated to just a few of the incredible words I have received over the years. Quite a few of these weddings are featured on my blog, to take a look at their wedding day just click on the image to take you there! “We have just watched through the highlights reel, it's beautiful. I wanted to express how grateful we are that you were there to capture our day for us. I really don't understand how you are able to have your camera pointed in so many directions at apparently the same time and to capture each moment so perfectly. Don’t have the words to say how thankful we are. “Oh my god!!!! They are the most amazing photos I’ve ever seen! “I think my all-time favourite images from a Rock My Wedding real wedding was photographed by Tony. We knew that we wanted a documentary style photography, and Tony’s portfolio was incredible. Tony was amazing on the day, we hardly noticed him and he was so professional. The photographs he produced were so incredible, and looking through them for the first time made us feel as though we were back there. On the day, he suggested to us that we could take a quick drive up on to the moors above our venue to catch the light before sunset. It was so difficult to leave our guests, but we are so glad we did it! It was actually really special just to take a bit of a breather together, and the photographs are so beautiful that it was totally worth it! “We absolutely love the pics! They are so great!!! Love the presentation too! That was unexpected and a pleasant surprise. I have so many compliments about the photos! Also everyone who spoke to you loved you and you just made us so at ease. “Our wedding day was very special for us and to be able to celebrate it with you made it perfect. Thanks for travelling from Scarborough to be there with us and thanks for immortalising the happiest day of our life’s in such a magnificent way. “Words can't do Tony's talent justice - one look at his photos says it all! The engagement photos he took for us were the best we'd ever seen (but we're a little biased), so we felt incredibly lucky when he was available and willing to fly all the way out to California for our April wedding. There are no other photographers in Southern California who are doing what he does. Tony's style is so authentic and personal; he sees what others don't notice, which is the sign of a great photographer. He spends time beforehand finding the best locations to get the absolute perfect shot. Looking back through our photos was such an emotional experience, because he really captured the feeling of the day perfectly. ”We found Tony online and immediately loved the style of his photography, deciding to book him for our May 2018 wedding. From the beginning, it was clear that Tony was very organised and took great pride in his work. Driving to the other side of the country was no issue for him either and he even came in a day early, so he could scope the area before the wedding. During our wedding day, Tony took control to ensure we got the shots we wanted, and he also had some great ideas himself. Some of the best shots we got, when Tony made us scramble across a farmer’s field! During the evening, Tony was like a wizard, discreetly blending into the surroundings to take shots and capturing some amazing moments. “We think you are Fabulous! 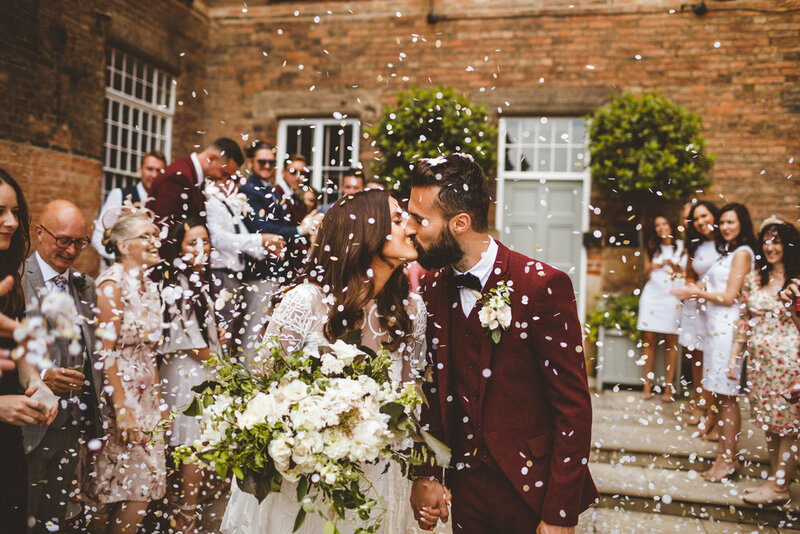 We couldn’t be happier with the photos, you captured every beautiful moment - The nerves, the panic, the excitement, sheer joy, laughter, tears and love. Every time we look at the photos it brings back the emotions and love we felt on the day. So many people have commented on how professional and inconspicuous you were and how BLOODY good the photos are. “Tony saw the nuances of our relationship, our personalities, and captured our spirit as a couple and individuals. He caught every single moment of happiness, whether it was quiet or shared. “Just wow! We had the pleasure of Tony photographing our wedding in Robin Hoods Bay in January and he was absolutely amazing. He made us both feel so relaxed, totally fitted in with our guests and took the most beautiful, natural photographs with many that we hadn't even realised had been taken. He completely captured the essence of our wedding with lots of laughter and fun shots. He stayed much longer than I thought and was so flexible in capturing the shots that I wanted (even changing my mind last minute and asking to go down to the beach in the freezing cold wind). “Tony used to work with Liam and once he had picked up photography I used to see his pictures cropping up all over on the internet. I didn’t want anyone else to do the photography so was very happy when Tony agreed to do them. He is a brilliant photographer, very calm and seemed to just blend into the day without me noticing which is why the photos are so natural. “Tony, you just had me crying, they are amazing. Tony’s ability to capture the most astounding images puts him in a league of his own. Having followed his work on Instagram I couldn’t imagine having anyone else photograph our wedding... and when we received our sneak preview of photographs we were so overwhelmed to see that our day had been captured as magically as all of the other weddings that Tony had on his profile before us. “Tony, these are so much better than I ever imagined they could be. Thank you so much. You have captured so much of the day. Our decision to hire a photographer was last minute as we were concerned about the expense but it was worth every penny. “We were lucky enough to have Tony take our wedding photos. He arrived bang on time looking very smart and stayed far longer than we expected! He's friendly and professional, giving me directions when I needed it and even helping my husband figure out his pocket square! We've had nothing but positive feedback from our guests who have been amazed at all the moments he managed to capture without anyone being aware he was even there! I was disappointed with the cloudy weather we had but Tony managed to use it to his advantage as it made all the other colours stand out more and look dramatic. He even helped me find my wedding cake baker and wedding transport, which was so helpful. “Tony was absolutely brilliant on both our engagement and wedding shoots. Tony is a "light connoisseur" and somehow manages to find the most beautiful pockets of light on even the cloudiest days (our engagement shoot!). Our guests described him as a ninja - they never knew he was there. “We had the blessing of Photograhy34 being our photographer on Saturday and I am so glad we decided to go with him! From start to finish Tony just snapped away but without us even noticing most of the time which was exactly what we wanted. Tony was immaculately presented, professional and very relaxed in his approach. I cannot thank you enough Tony! Your service is second to none and your pictures are amazing! “A work colleague of mine recommended Tony and we are so glad she did. Tony not only captured our day perfectly, he was so wonderful to work with. Firstly, he really took the time to get to know us and even went to look around Saltmarshe Hall prior to the wedding to suss out the grounds (all of his own accord). “We found Tony online and instantly fell in love with his style of photography. He has such a great ability to capture natural moments, helping to tell a story. He also takes some epic couple shots, making the most of the landscape around him. Tony takes the time to get to know the area around the venue and told us we would go for a walk at some point in the evening and he did not disappoint. “We just wanted to say thank you very much for the wonderful photographs and slideshow. It was a pleasure to have you at our wedding and your images capture the mood and emotion perfectly. It was a fantastic day and we are very glad that you were there to record it for us. “We had the pleasure of having Tony be our wedding photographer in September and I can't put into words how glad I am that we did! We specifically wanted natural photos, I didn't want the day to be spent lining people up for group photos but I was worried not every moment would be captured, how wrong was I.
Tony has kept in touch from beginning to end and nothing has ever been too much trouble. He arrived on time on the day and just blended in with the guests! The photos arrived yesterday and every single one of them is truly stunning (Most of them we didn't even realise had been taken!) Both me and Luke spent the evening sobbing at how beautiful the pictures are. “Thank you for the beautiful photographs you took of both our wedding and pre - photo shoot. We couldn’t be happier with them. They captured the day perfectly and were to natural. The slideshow was fab too, our family haven’t stopped watching it, they show everyone! “WOW!! Thank you so much for our photos, we absolutely love them. They are just perfect and capture the day brilliantly. Thank you for your hard work on the day and putting them all together. Everyone commented on how lovely it was to have you around during the wedding, nobody felt like they had to strike a pose every five minutes which is exactly what we wanted. We feel so lucky to have such great photos to treasure for years to come.